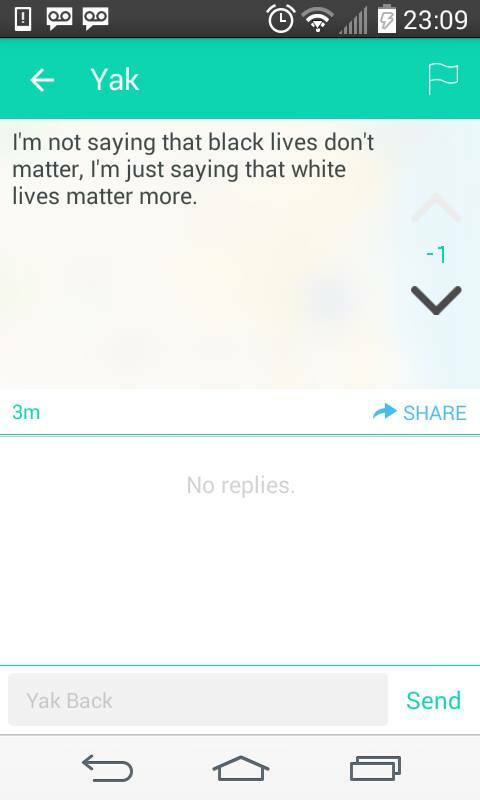 Around 10:35 p.m. last night, I went on Yik Yak to see what was going on around my college campus. I got back to my apartment from dorm-storming with my friend who’s running for Student Body President and was exhausted. I was laying in bed and didn’t immediately fall asleep, so I decided to check social networking sites to see what was going on. Scrolling down the feed, my heart dropped. All I saw were posts mocking the experiences of African-Americans, mocking social justice movements, and racist commentary. I was in shock; I couldn’t believe that my peers could be so ignorant and hurtful. The amount of blatantly racist comments coming from Muhlenberg students was both appalling and disgusting and made my stomach churn. More than 12 hours later, my stomach is still in knots. The yaks started as an attempt to raise awareness and to stand in solidarity with the events happening at the University of Missouri. As students started posting about their encounters with racism using the hashtag #blackoncampus, other students decided to chime in and turn the experiences of African-Americans on college campuses into a joke while others began making racist commentary. 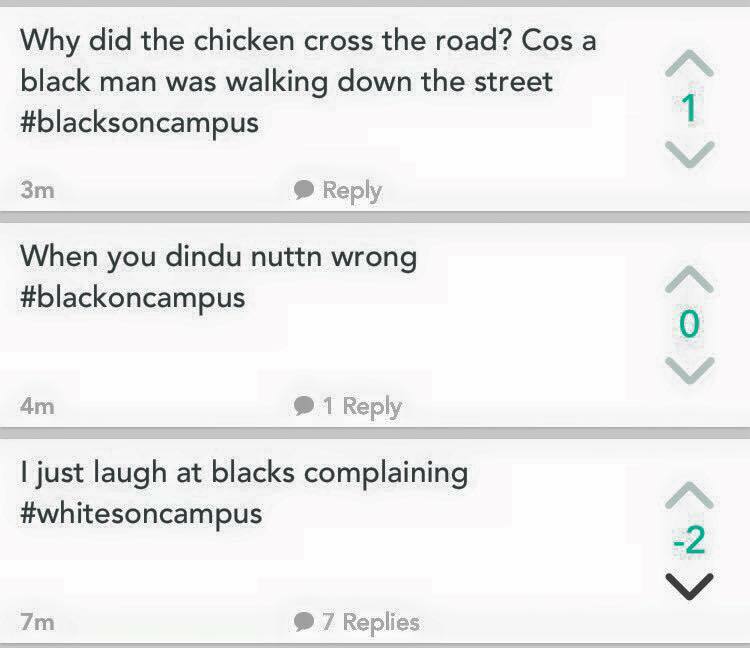 What bothers me the most is not the number of negative yaks posted or the racists remarks, because racism is everywhere and for all know it could have only been a small group of students writing the racist comments. What bothers me the most is that those yakkers are hiding behind the anonymity of the app. 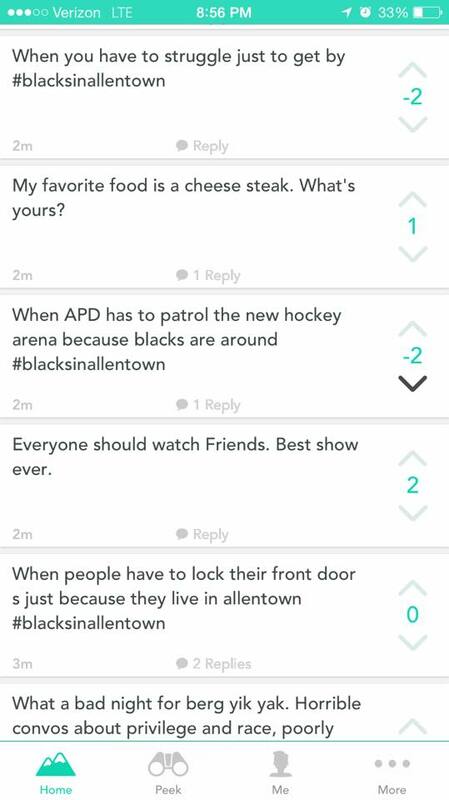 Yik Yak is a location-based social network where users can anonymously post yaks within a five-mile radius. It is the most widely accepted app used on college campuses. The app was meant to be “a place where communities share news, crack jokes, ask questions, offer support, and build camaraderie,” Brooks Buffington, one of the co-founders, once explained. But the innocent bickering has the ability to turn into a feed of rude, disrespectful remarks that can be threatening and hurtful. Yik Yak is supposed to be a “self-policing” community where yakkers can downvote posts they do not like; after 5 downvotes, the post will be deleted. The app is also supposed to be able to detect abusive and racist remarks, but after seeing all the yaks posted last night and yaks posted on Mizzou’s yak feed, I’m not so sure their system is working very well. The app has made recent headlines because students have been using it to make offensive comments and threaten mass violence (i.e. Mizzou). So why does the veil of anonymity create such a hateful environment? Anonymous social networks, like Yik Yak, give individuals the freedom to bring out their worst selves and say whatever they want without remorse. Anonymous social networks are the perfect digital realm for trolls to prosper because people do not have to worry about face-to-face confrontations since they are using a faceless computer-mediated form of communication. The key word is faceless. As Stephen Marche explained, “The human face is the substance of the infinity of another person and is the key to intersubjectivity.” The face is the most emotive part of the human body with many believing that looking into someone’s eyes is as close as you can get to looking into their souls. So the inability to see the person’s face results in the inability to recognize that you are communicating with someone who is biologically similar to you with feelings, emotions, and a shared humanity. The digital realm of Yik Yak is a world stripped of shared humanity. The increase in faceless communication also reduces empathy and leads to antisocial behavior. Face-to-face conversation gives people the opportunity to learn about themselves and others because there is the ability to see themselves through the eyes of another. So when trolls anonymously post mean comments, they may realize they are being hurtful, but they are not seeing the facial expression that conveys hurt which is important in developing intersubjectivity and empathy. Faceless communication is harmful to human development, but it is also widely popular. Texting, emailing, and speaking on the phone are all other forms of faceless communication. With advances in technology and our overuse of social networks, it’s also deeply embedded in our society. For starters, we can all start by deleting Yik Yak. We should also learn how to be empathetic. One way to do this is by having more face-to-face conversations. So put down the phone every once in a while and talk to your friends, and actually pay attention them. Posted in mizzou, opinion, yik yak and tagged anonymous, black on campus, college campuses, computer mediated communication, empathy, face-to-face communication, faceless, facelessness, humanity, intersubjectivity, lack of empathy, mizzou, muhlenberg, opinion, racism, trolling, trolls, yik yak. Bookmark the permalink.